Under our Common Errors Category in Akademia, we have several posts dedicated to explaining words in English that users confuse with one another. 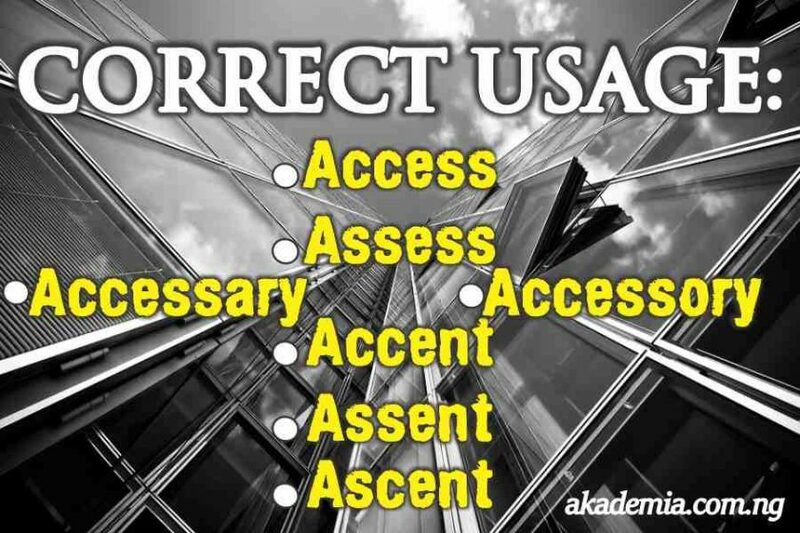 This particular post, Correct Usage: Access, Assess, Accent, Ascent and Assent, falls under that category. Most of the words in English have similar sounds, spellings but different meanings, see Homonyms. Homophones are words with same sounds but different spellings and meanings while others have same spellings, different meanings and sounds and we refer to them as Homographs. Without a proper understanding of Parts of Speech and possession of pronunciation skills, there will always be a confusion when dealing with these similar words. We will examine these words that are closely related and have the tendency to confuse you and explain each pair with as much clarity as possible so that when next you have to use any of them, there will be no modicum of confusion or mix up. Are you ready? Let the class begin! Each of these words has their unique pronunciation and usage. Many cannot distinguish them in terms of spellings and meanings. Let us see the pronunciation patterns of each word before we examine other distinct features that will help identify each and use as appropriate. If you look closely at the phonetic patterns of these seven words, you will realise that only words 2 (assess), 4 (ascent) and 5 (assent) are without the /k/ sound which we phonetically refer to as voiceless velar plosive or voiceless velar stop. So you can see that you have been pronouncing some, if not all these words, incorrectly. You can immediately adjust to pronouncing them correctly. He tried in vain to gain access to the building. We have limited access to the internet in the school library. The lawyer has access to confidential information. It is also used to refer to the right of a parent to spend time with his or her children, E. g.
The man was allowed access to the children on weekends. We access details from the computer file relating to the accounts. They accessed the phone by a laptop. In modern usage, many technical words become used, and indeed overused, in the general language. Thus the verb access can now be found meaning to obtain information, not on a computer, e. g.
She accessed the information in the filing cabinet. It can also be found in the sense of gaining entry to a building. Their attempts to access the building at night were unsuccessful. Assess is a transitive verb which means to judge something, examine in order to judge or evaluate it. It means to determine an amount or calculate a value based on various factors. Insurance adjusters are assessing the damage. The surveyors are assessing the damaged buildings. Other words for assess include: appraise, evaluate, measure, scope, valuate, value censor, grade, mark, praise, rate, reassess, re-evaluate, score, value, etc. This is a noun which refers to a distinctive manner of expression: that is, an individual’s distinctive or characteristic inflexion, tone, or choice of words. E. g.
He answered with an accent of bitterness. A way of speaking typical of a particular group of people and especially of the natives or residents of a region. Many non-natives speak English with their local accents. He can speak English with different accents. It means an articulatory effort giving prominence to one syllable over adjacent syllables or a word within a phrase; that is the prominence thus given a syllable or a word. E. g.
A good speaker of English must be able to accent every word appropriately. He places an accent on the wrong words. Accent refers also to a mark used in writing or printing to indicate a specific sound value, stress, or pitch, to distinguish words otherwise identically spelt. It is equally the main emphasis; that is, an aspect of a situation we emphasise. E. g.
In his lecture, the accent was on global best practices. It also means ‘a distinctive style that is characteristic of a particular person, region, or artistic school’, the stress placed on specific notes in a piece of music, or the symbol printed above the notes to indicate this stress. As a transitive verb, accent means: to stress or emphasize something, e.g. to pronounce a word or syllable more prominently than those surrounding it or play a musical note or beat with greater volume or attack. It also means to mark something such as a letter or word with a written or printed accent. He accented every syllable in the word. Paul accents the drum cymbals each time he plays a hymn. The lithographer accented all the indigenous words in the text. His ascent to sudden fame was surprising. The elevator’s rapid ascent makes him feel giddy. The climbers’ ascent to Mount Everest was torturous. The voters assented to the proposal to recall the Senator. She nodded in assent to the conditions. The governor assented to our request. We can use these two interchangeably especially when we are making reference to an accessory. We can use these two terms to refer to a partner in crime – an individual who helps another commit crime; though the former is preferable. Nevertheless, we only use accessory to describe any enhancing or ornamental extra that may not be strictly necessary; a supplementary component that improves capability. In this sense, we are talking about add-ons, appurtenances, supplements, accoutrements, furnishings, fittings, fixings, paraphernalia, trappings, trimmings, etc. We have looked at these seven closely related words that could bring confusion and have clearly explained each one with illustrations. There is no reason for confusion anymore. You may want to share this post with your parents, teachers, children, spouse, siblings, friends and colleagues so that everyone can be on the same page in terms of correct usage of Access, Assess, Accent, Ascent, Assent Accessory and Accessary! You can also take a look at the post on Academia vs Academic and other similar enlightening posts. See you around!